Through projects like Metacity/Datatown to Pig City to the 3D City Ballet, the firm’s just-the-facts analytical approach to the problems of urban density have yield results that are inventive, increasingly sophisticated, and, yes, beautiful. It’s fitting that the exhibit’s in New Haven; after all, what is Connecticut, but a classically American “approach to the problems of urban density”? MVRDV’s never met a sprawl it didn’t want to render obsolete. Their “more-in-less-space-is-more” love of the city can be attributed in part to their early tenure with Rem Delirious New York Koolhaas (they were over him before he was ever kool). But it’s also the hardearned appreciation of space that comes from living in a country which, according to Nature’s logic, should be entirely underwater. MVRDV’s most-discussed theoretical project is Pig City, their turns-out-to-be-explosively-controversial proposal to concentrate Holland’s massive (and land-intensive) pork industry into self-contained skyscrapers. The Dutch architecture site Archined has many heated comments about Pig City’s moral/ethical implications. Although Winy Maas (the M in MVRDV) told me about it in May, I didn’t write about it here, but Pig City (and the firm) got caught up in the political upheaval and violence that shocked the Dutch last Spring. 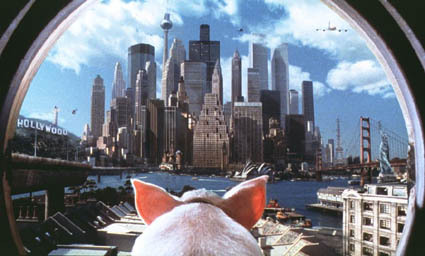 Pim Fortuyn had appropriated Pig City into his right-ist party’s platform. The dam on the lagoon broke when Fortuyn was assassinated by an leftist (and animal rights activist), and Winy & Co. were faced with unexpected censorship and death threats. America’s probably a vapid, welcome respite for these guys. While a suburbanite couple in the gallery with me today sniffed, the guestbook was full of celebratory comments. Winy’s gonna have groupies, too; he’s taking the Eli’s through the (s)paces next Spring, studying the urban mechanisms of New York. All nice, but they also enjoy America’s greatest reward for the contemporary architect, the adulation of Hollywood celebrities. Architecture writer David Sokol, reports in Metropolis (three times!) that “MVRDV, in case you haven’t heard, is actor Brad Pitt’s favorite architecture firm.” Actually, no, I hadn’t heard, so I looked it up. According to The Pitt Center, MVRDV are only Pitt’s third favorite architects (after Gehry and that damn Koolhaas, FYI). Brad say’s they’re #3, I say they’re #1. Write that down.